More people are asking for information regarding organic lawn care. Many people want to decrease or eliminate the use of synthetic fertilizers and pesticides in their home lawns. There is concern that some of these products may be harmful to humans, beneficial insects, wildlife and pets. With proper knowledge, the homeowner can use naturally occurring resources to maintain a home lawn without using synthetic products. The term "conventional lawn care" as used in this fact sheet implies the use of synthetic fertilizers and pesticides that are applied by the homeowner or a lawn care service. Natural organic lawn care is different from conventional lawn care. Soil can be improved by adding organic matter such as compost (made from plant wastes), certain animal manures (chiefly composted cow, chicken or horse manures) and other naturally occurring substances. Improved soil contributes to healthy plants that will be less susceptible to damage from pests or environmental stress. Fertilizer may be applied less frequently than in conventional lawn care but timing of application becomes especially important. Weeds, insects and diseases are managed by cultural practices that are oriented toward prevention. Natural organic methods also emphasize the recycling of organic wastes. Limited scientific research has been done on exclusively natural organic lawn care programs. However, well-documented research has been done on many practices that are an integral part of organic lawn care such as core aeration, mowing height and top-dressing with compost. Recommendations for a completely natural organic approach are therefore based on years of collective experience. Additional fact sheets regarding turf care and maintenance are available by searching ohioline.osu.edu. The first step in switching from conventional to natural organic lawn care is to assess the quality of the existing lawn. If an existing lawn contains few weeds and consists of desirable turfgrass species, natural organic methods and cultural practices can maintain a satisfactory lawn. However, if a lawn has excessive weeds and/or consists of undesirable turfgrass species, it is best to kill the entire lawn and start over. After this decision has been made, the next step is to assess soil quality. Natural organic gardening and lawn care methods underscore the importance of good soil quality as a primary factor in growing healthy turfgrass. Good soil contains adequate organic matter, which improves soil structure by binding mineral soil particles together to form aggregates. This creates greater pore space among the aggregated particles, providing optimal conditions for root growth. Increased pore space improves both soil drainage and water-holding capacity and also improves soil aeration. In addition, sufficient quantities of organic matter in the soil aid in nitrogen fixation, help reduce soilborne plant diseases, and help hold nutrients for plant use. Good soil also contains adequate amounts of the nutrients plants need. A useful tool in the assessment of soil quality is a soil test performed at a soil-testing lab. Most tests will measure pH and various nutrient levels. Also included will be recommendations for chemical fertilizer application to correct any deficiencies. Organic matter tests are usually available as an option and measure the percentage of organic matter in the soil. In Ohio, 4 to 6 percent organic matter in the soil is considered satisfactory. If an existing lawn is to be preserved, the transition to natural organic methods can be instituted at any time. See the “Natural Organic Lawn Care Calendar for Ohio” at the end of this fact sheet for details. When it is time to fertilize, choose appropriate organic fertilizers to correct deficiencies. Although soil test recommendations are based on the use of chemical fertilizers, use the nutrient rates recommended as a guideline for the application of natural organic fertilizers. More information on fertilization will be found in the “Maintenance” section. An existing lawn of poor quality may need to be killed and re-established. Killing a lawn may involve use of a non-selective herbicide. The use of glyphosate (Roundup®) or glufosinate (Finale®) might be considered, as these do not leave residues in the soil. Tarping the lawn with plastic in summer heat can also be used the kill the existing grass, though this may be difficult to do based on the size of the lawn. The advantages of starting a new lawn are: 1) grasses can be selected that require less nutrition and water, and that are resistant to insect and disease attack; 2) soil can be amended with organic matter; and 3) nutrient deficiencies can be corrected (per soil test) before seed is sown. Adding organic matter to the soil before seeding is more effective in changing the percentage of organic matter in the soil than top-dressing an existing lawn with compost. Using appropriate turfgrasses, adding organic matter to soil and correcting nutrient deficiencies will go a long way toward producing a healthy lawn that will be easy to maintain organically. Cultural practices in natural organic lawn care are similar to those used in conventional lawn care and are described in the “Maintenance” section. Proper maintenance techniques and timing are more crucial in a natural organic lawn since the aim is to prevent potential problems. There are two key points to keep in mind when going organic. The first is that compared to conventional lawn care, organic methods take longer to produce visible results in most cases. Since the organic approach stresses the ongoing building of soil, there are no quick fixes as promised by chemical fertilizers. Secondly, perfection is an unreasonable expectation. Tolerating a few weeds or insects here and there is part of the natural organic approach. When natural organic methods are used consistently over time, a reasonably uniform green lawn that is resistant to adverse environmental conditions and/or pests can be expected. In Ohio, cool-season turfgrasses are recommended and only four species are useful for home lawns: turf-type tall fescue, perennial ryegrass, fine fescue and Kentucky bluegrass. 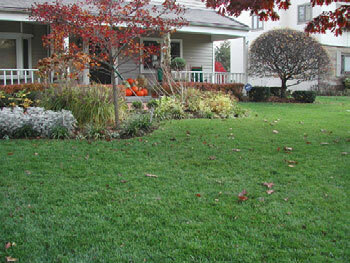 Turf-type tall fescue is perhaps the best choice for a natural organic lawn. The improved “turf-type” cultivars have dramatic differences in quality and appearance from the traditional Kentucky-31 tall fescues. These new cultivars are less coarse, grow more upright, tiller more readily, and are darker green in color, making them a suitable choice for use in home lawns. It is often recommended not to mix tall fescue with other turfgrass species because of its distinct color, texture and habit; when seeding, it is usually sown 100 percent. Tall fescue tolerates low soil fertility and highly compacted soils better than Kentucky bluegrass, and has a lower maintenance requirement. It has a fast germination rate, holds up well to heavy traffic and possesses good insect and disease tolerance. It is typically able to survive Ohio's droughts without irrigation and remains green because of a deeper root system. It is more sun and shade tolerant than any other species for use in Ohio. Because it does not have rhizomes, it does not form thatch. Most turf-type tall fescues have beneficial fungi called “endophytes” that are effective in killing lawn-damaging insects such as billbug larvae, cutworms, chinch bugs and sod webworms. However, endophyte-enhanced tall fescues should not be used in pastures since they can be injurious to some grazing animals. Avoid using the old pasture-grass types of tall fescue for lawns, such as Kentucky-31, since they have no endophytes, are clump-forming and have a coarse texture. Perennial ryegrass is exceptionally cold- and heat-tolerant. It is not recommended for use alone in a lawn but is often mixed with Kentucky bluegrass. Perennial ryegrass establishes quickly, forming a dense canopy that will crowd out weeds. As with tall fescue, perennial ryegrass may also host endophytes and does not form thatch. In the past, fine fescue was the grass of choice for shade until tall fescue was found to be superior. Fine fescue grows well in acidic poor soil. As the name implies, the leaf blade texture is fine. Its nitrogen needs and thatching potential are low. It is frequently mixed with Kentucky bluegrass and will dominate in shady areas. Select cultivars with endophytes for surface insect control. When considering a Kentucky bluegrass lawn for natural organic maintenance, several factors must be kept in mind. It requires higher than average nitrogen levels, will turn brown and go dormant if not irrigated during hot, dry summers, and is prone to thatch formation and its associated problems. It is considered a high maintenance grass, especially if growing on poor quality soils, and may not be the first choice for a natural organic program. 1Use only improved tall fescue cultivars. Do not use Kentucky-31 tall fescue, which is a pasture grass without endophytes. Blends using two to three cultivars of tall fescue are recommended. 2Where improved grasses are used in mixtures, it is recommended that at least two cultivars of each species be used. Use shade-tolerant bluegrass cultivars, if available, for shady sites. 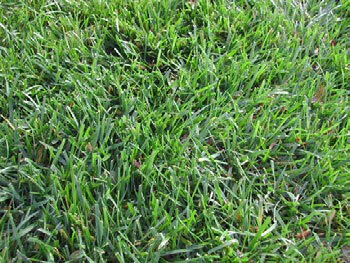 3This mix of turf-type tall fescue and bluegrass is commercially available. You will find some variation in commercial grass seed mixes from the recommendations stated above. Look for seed labeled “endophyte-enhanced.” Certain cultivars of perennial ryegrass, turf-type tall fescues and fine fescues contain these beneficial symbiotic fungi. These microscopic fungi are found between the cells of the plant, mainly in the leaves, and produce chemicals that are toxic to insects such as sod webworms, chinch bugs, and billbugs that feed on the leaf blades or stems. In OSU research, endophyte-enhanced perennial ryegrass that was slice-seeded into an existing bluegrass lawn resulted in 50 to 60 percent of the lawn containing the endophyte after two years. The research shows that this level controls billbugs, chinch bugs and sod webworms, and demonstrates that endophytes can be effectively added to existing lawns. If the grass is to be used for pasturing, do not use endophytic grasses since they may be injurious to grazing animals. When starting a new lawn or overseeding an existing one, it is best to use high-quality certified seed containing zero percent weed seeds. This information will be noted on the seed label. In general, it is best to sow a blend or mixture of seed rather than a single cultivar of a single species. A “cultivar” is a cultivated variety developed for positive attributes, be it color, drought tolerance, spring green-up, disease resistance, etc. A “blend” is two or more cultivars of a single species, and a “mixture” is a combination of two or more species that should be similar in color, texture and growth habit. We recommend using the improved cultivars of these turfgrass species. You can find information on various cultivars at the National Turfgrass Evaluation Program web site at ntep.org/. See Table 1 for recommended seeding blends and mixtures. The best time to seed a lawn in northern Ohio is between August 15 and September 15. In central and southern Ohio, any time in September is acceptable. Lawns seeded later in the fall may fail because the seedling grass may not produce sufficient growth to survive the winter. If seeding cannot be done by October 15 in northern Ohio or by October 30 in central and southern Ohio, it is best to postpone the job until spring. The earlier in the spring the seeding can be made (preferably March), the better the chances of success. Proper mowing practices are especially important for an organic lawn to give grass a competitive edge over weeds and to avoid disease. Organic lawns are generally mowed higher than conventional lawns. Longer grass shades the soil, helps prevent weed seed germination, keeps the soil cooler, and reduces water loss. Recommended mowing heights for the four species of turfgrasses are 2.5 to 3 inches for Kentucky bluegrass, perennial ryegrass and fine fescue, and 2.5 to 4 inches for tall fescue. A cardinal rule of mowing is the one-third rule, which means never removing more than one-third of the blade of grass at a time. To maintain the lawn at a 3-inch height, mow before the grass is 4.5 inches high. When grass is growing quickly in the spring, mowing will be more frequent. In summer, when grass grows more slowly, mowing frequency is decreased. In areas with prolonged periods of snow cover where snow mold is a problem, the last mowing of the season should be 20 to 30 percent lower than normal to discourage fungal diseases in winter. Leave clippings on the lawn; they break down quickly, returning nutrients and organic matter to the soil. Grass clippings left on the lawn provide up to 30 percent of a lawn's seasonal nitrogen needs and do not contribute to thatch formation. Mulching mowers chop clippings finely, further hastening decomposition. Non-mulching mowers leave longer clippings that may form clumps. Any clumps should be broken up with a leaf rake and dispersed evenly on the lawn, or re-mow the area in a different direction on the following day. Mow at right angles on alternate mowings to keep grass height even and to promote upright shoot growth. This becomes especially important when grass is mown higher. In periods of continual rainfall, it is preferable to mow wet grass than to let it get too long while waiting for it to dry out. When mowing wet grass, the mower blade must be sharp. A dull blade will tear the grass instead of cutting it cleanly. 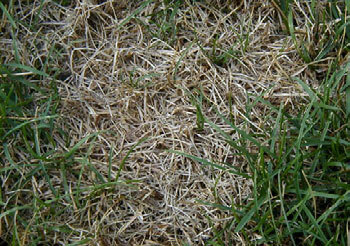 Ragged tips cause the grass to lose more water, leaving plants more vulnerable to disease. The application of fertilizer ensures adequate soil fertility and contributes to satisfactory plant growth. Many substances used as organic fertilizers also add organic matter to the soil. The three major nutrients plants need are nitrogen (N), phosphorus (P) and potassium (K). Nitrogen is needed for vegetative growth and good green color. It is used up quickly by growing plants and must be replaced regularly. Phosphorus is important for good root development and many growth processes. Potassium is essential for physiological functions, disease resistance and winter hardiness. *These are general N-P-K values and they may vary somewhat by source of product. ^NA means "not applicable" since these products contain no nitrogen. While both synthetic chemical and natural organic lawn fertilizers supply these nutrients, there are some important differences between them. Natural organic fertilizers release nutrients more slowly, making them available steadily over a longer period of time. Natural organic fertilizers preserve the biotic quality of the soil, encouraging earthworm populations and normal microbial activity. Though synthetic chemical fertilizers are often blamed for reducing earthworm populations in the soil, research has shown that only ammonium nitrate actually does so. One major disadvantage of organic fertilizers is that they tend to be bulky compared to chemical fertilizers, so more pounds of product must be applied to deliver the same amount of actual nutrient. Most organic fertilizers are derived from animal manures and previously living plant and animal sources. Animal sources include bone meal and blood meal as well as cow, chicken and horse manures. Seaweed, alfalfa meal and cottonseed meal are examples of plant-based sources. Some of these materials are more readily available in some parts of the country than in others. Processed or composted sewage sludge such as Milorganite® and Com-Til® are also considered to be acceptable natural organic fertilizers. Unaltered, naturally-occurring minerals in the form of rock powders such as rock phosphate (high in phosphorus) and greensand (high in potassium) are used even though they do not come from previously living sources. Be aware that some fertilizers sold as “organic” or “natural” may be enhanced with synthetic chemical fertilizers. Always read the label. Table 2 illustrates the approximate nutrient analyses of several organic fertilizers. Some are best used for correction of a specific nutrient deficiency and others are better suited for routine scheduled fertilizations. Complete fertilizers supply all three macronutrients, N-P-K (nitrogen-phosphorus-potassium). The three numbers shown on a bag of complete fertilizer show the percentage by weight of each nutrient. This is called the analysis. Ratio relates to the relationship or parts of each element to the others in the fertilizer analysis. For example, the analysis of seabird guano is 12-8-2, and the ratio is 6:4:1. Fertilizers with ratios of 3:1:2, 4:1:2, or 5:1:2 are optimal for Ohio lawns. Many organic fertilizers do not meet a specific ratio need. In this event, use the N value as the basis for fertilizer selection. Always use soil test results as a guide when selecting fertilizers. To determine how much fertilizer to apply you must know the analysis of the fertilizer, the amount of actual N needed per 1,000 square feet of lawn, and the square footage of lawn to be fertilized. A general rule of thumb is to apply 1 pound of actual N per 1,000 square feet. Divide actual N needed by the percentage of nitrogen contained in the fertilizer, expressed as a decimal, to determine how much fertilizer to apply. For example, if using cottonseed meal with an analysis of 3-1-1: 1.0 ÷ .03 = 33 pounds. Thirty-three pounds of cottonseed meal per application are needed to supply 1 pound actual N per 1,000 square feet. Table 3 shows the annual nitrogen requirement based on turfgrass species if under a low or high maintenance program. Remember, the soil on the property plays a key role in fertilizer recommendations, so don't guess—soil test first! University research has shown that a schedule of late summer/fall (September) and late fall (November) fertilization is best for home lawns. This is when turfgrass plants are enlarging their root systems. Good root growth in the fall will result in better top growth in the spring. Fall fertilization also contributes to better color late in the fall, earlier spring green-up, and fewer disease problems. Of the four species of turfgrasses, turf-type tall fescue is the most drought-tolerant, followed by fine fescue, Kentucky bluegrass and perennial ryegrass. Bluegrass and perennial ryegrass are very close in drought tolerance, but bluegrass can withstand drought conditions longer (a period of four to six weeks) than perennial ryegrass because of its rhizomes. Too much or too little water can wreak havoc on a lawn. Too much water favors the development of fungal diseases, which can cause unsightly lawn damage, while too little water leads to dormancy, weakens plants and can eventually kill them. With a natural organic lawn, it should be decided early in the season whether to irrigate regularly to maintain color or not to irrigate and allow the lawn to go dormant in a hot, dry summer. Tall fescue generally does not require irrigation but fine fescue, Kentucky bluegrass, and perennial ryegrass will need to be irrigated to stay green during prolonged hot, dry weather. If you determine to keep the lawn green through the summer, water correctly. When rainfall is insufficient and the soil is dry, apply 1 inch of water weekly or enough to wet the top 6 to 8 inches of soil. Measure rainfall and applied water with a rain gauge. Check the soil with a trowel or spade to see if the water has penetrated to the depth of the roots. Irrigation is best done early in the morning to decrease water loss from evaporation as temperatures rise later in the day. Avoid late afternoon watering that extends the time leaves are wet and that may increase certain disease problems. Note that irrigating Kentucky bluegrass lawns in mid-summer (July) can contribute to grub problems. July is the egg-laying period for most Ohio grubs. If the soil is moist at this time, the eggs will survive; once grubs have hatched in August, they can tolerate drought conditions. If you determine to allow the lawn to go dormant, keep in mind that under severe, prolonged drought conditions even dormant lawns may need some irrigation in order to survive. Apply one-half inch of water every four to six weeks to keep the crowns and roots alive. Thatch is an organic layer composed of old grass roots, crowns, rhizomes and stolons that sits on the soil surface. A thatch layer greater than 1/2-inch thick may inhibit infiltration of water, air, and fertilizer, harbor insects, and create an environment that invites disease. Thatch is a problem most frequently found in heavily fertilized Kentucky bluegrass lawns. Fine fescue is also susceptible to thatch formation, but less so than Kentucky bluegrass, because its rhizomes are shorter. Soils with sufficient amounts of organic matter, beneficial microorganisms and earthworms slow thatch buildup. Soil cores following core cultivation. Excessive thatch. Core aeration is the mechanical removal of soil cores from the lawn. This practice relieves soil compaction and manages thatch, thus improving water and air movement in the soil. Loosened soil allows for improved root growth. Actual soil cores must be pulled from the soil at a rate of about nine per square foot and are then left on the lawn surface to decompose. Methods that employ tines or spikes to simply make holes in the ground without removing soil cores are ineffective. Core aeration is best done when adequate cores can be pulled. Spring and fall are often considered ideal times, however, the operation can be done anytime there is adequate soil moisture to pull cores. Core aeration can be done by either lawn care operators or by the homeowner using rented equipment. 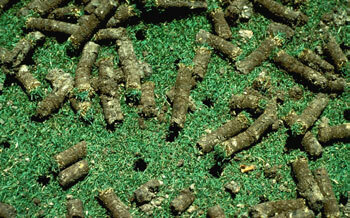 Surface application of compost to established lawns is called topdressing. Compost supplies some nutrients but is primarily applied to add organic matter. Compost application may also speed up the decomposition of thatch. Topdressing should be done in conjunction with core aeration in the spring or fall, when temperatures are cool. If compost is applied without coring, a layer of organic matter builds up on the soil surface. Topdress before or after core aerating, then drag the lawn with a mat so the compost is worked into the holes. A 1/4-inch layer of compost is evenly applied to the lawn with a spreader or by the “dump and rake” method. Compost may be purchased in bags or by the truckload or it can be homemade using fallen leaves and plant debris. Approximately 21 cubic feet (3/4 yard) of compost is needed to cover 1,000 square feet of lawn (a 30-gallon garbage can holds about 4 cubic feet of compost). Topdressing on top of thatch without heavy core cultivation, a minimum of 20 cores pulled per square foot, will contribute to the thatch problem and is not recommended. Overseeding is a technique that replenishes desirable turfgrass and produces a denser lawn that will out-compete weeds. It is not a technique that needs to be done annually. Instead, it is usually done if the lawn quality begins to deteriorate and bare or thin patches appear due to drought, insect, or disease injury. If overseeding, match species and cultivars to the turfgrass(es) currently in the lawn to achieve a uniform appearance. Use a slice-seeder to overseed; this machine makes shallow slits in the soil and deposits grass seed into them, assuring good seed-to-soil contact for high germination rates. Simply scattering seed on the lawn with no cultivation is ineffective and is not recommended. Overseeding is done at the same times recommended for seeding a new lawn. When overseeding, the lawn is first mown short at 1 to 1.5 inches, then core aerated. A slice-seeder then deposits seed at the rate of 1.5 times the amount of seed recommended on the package. Sowing heavily ensures good germination rates under less than ideal conditions. 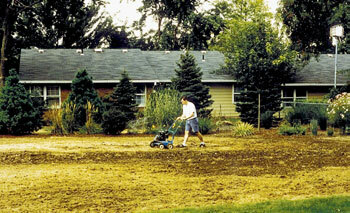 After seed is deposited, the lawn is top-dressed with compost to lightly cover the seed and then watered well. Return the mowing height to normal. Foot traffic should be discouraged at this stage. After the initial soaking, watering is done frequently and lightly to keep seed moist until it germinates. After most of the seed has germinated, the lawn can be watered at a normal maintenance rate if rainfall is insufficient. In the fall, tree leaves left on the lawn over a long period of time can kill patches of turfgrass. Dry leaves may be chopped finely by running a mulching mower over them. These may then be spread evenly over the lawn with a leaf rake and left to work their way into the soil. Or, spread leaves over the lawn and mow over them in two directions. When kept up with weekly, leaves can be easily recycled into the lawn. If there are too many chopped leaves to sift easily into the lawn, they should be removed and composted. Work done at Michigan State University has shown that recycling tree leaves on a lawn will not increase thatch build-up. There are several pests that can affect lawns, with weeds perhaps being the most problematic. In the organic approach to lawn care, synthetic chemicals are not used to manage pests. Cultural practices and biological options are used, when available. Weeds are defined as plants growing where they are not wanted, but are seldom a serious problem in a well-managed, vigorous lawn. A lawn established on high quality topsoil will be dense and therefore have few weeds. In an organically managed lawn, you may need to rethink your definition of weeds. For example, consider leaving clover in the lawn as a desirable species. Clover is a “nitrogen-fixer,” meaning it can convert nitrogen in the atmosphere into a useable form that will provide nutrients for the lawn. 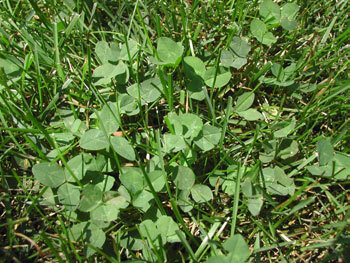 Clover will reduce the amount of nitrogen fertilizer that needs to be applied to the lawn. At the same time, one of the main concerns with clover is that the flowers attract bees, and some people are allergic to their stings. Weeds are survivors that often thrive under conditions that turfgrasses cannot tolerate, and can be found where soil has been exposed or disturbed by compaction, planting activities, or maintenance activities such as sidewalk edging. For example, goosegrass and knotweed readily colonize heat-stressed and compacted soil sites along sidewalks. Weeds also occur where grass is weakened by adverse environmental conditions such as drought, thatch accumulation, diseases or insect pests, to the extent that the grass cannot compete for nutrients, water or light. Exposure to de-icing salts and dog urine can also leave bare spots where weeds will invade. Weeds are also common where the grass species is not well-adapted to its environment and loses density. Many weed species also possess efficient methods of dispersal such as wind dissemination of winged or hairy seeds, or the ability to spread rapidly by rhizomes, stolons or tubers. The seasonal abundance of weeds is related to their life cycles. Annual weeds grow, flower and produce seed in a single season; they die at the end of that season. Summer annuals grow from spring until fall and are killed by low fall or winter temperatures. Winter annuals are present from fall to late spring and are usually not found during the summer. Biennials grow vegetatively during the spring, summer and fall of their first year, survive over winter, and flower and produce seed in the next growing season, then die. Therefore, some biennial stages are likely to be present at any time of the year. Perennials return year after year from a hardy crown and root system and can produce seed each season. Knowledge of the life cycle and growth habit of a particular weed species is an important part of its management. For example, mowing a patch of annual weeds to remove the flowers can prevent seed set. Cultivation of weeds that produce rhizomes, stolons, or bulblets breaks these structures into smaller pieces and may therefore result in dispersal rather than elimination of the weed. Regularly inspect the lawn for actively growing weeds, as well as newly germinated weed seedlings. Weed species tend to be found in certain habitats, so monitoring for a particular weed should be based on knowledge of its biology. 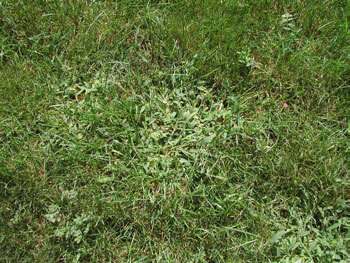 For example, crabgrass is a spring annual that needs light to germinate. Therefore, crabgrass seedlings are most likely to be found in thin areas of the lawn in the spring. Mid-summer would be an excellent time to look for mature plants to identify seed sources for the following year. Similarly, late fall would be the best time to look for seedlings of winter annuals such as henbit or annual bluegrass. Annual grassy weeds such as crabgrass, goosegrass and foxtails are considered major weeds because they can effectively compete with grasses and can significantly reduce lawn density in a single season. High mowing retards annual grass weed populations, but when monitoring indicates increasing populations of annual grasses, an application of an organic pre-emergent herbicide should be planned for the following spring. To be effective, this herbicide must be applied in early spring prior to weed seed germination. Dandelions are common in home lawns, especially where the lawn is thin or mowed too short. One way to eliminate them is to exhaust their stored energy. To do this, cut as much of the dandelion roots as possible beginning in early spring, immediately after they have leafed out. Continue this as new growth appears. The root will send up new growth until the plant runs out of energy. Mowing at 2.5 to 3 inches for the cool-season grasses will keep the lawn dense and discourage weed seed germination. The growing point for grass is near the crown, while the growing point for many weeds is near the top of the plant. High mowing will preserve grass crowns and leaves for photosynthesis and eliminate weed flowers and seed heads. Frequent mowing will prevent or reduce seed production in some weed species. Fertilize more heavily in fall and keep fertility levels up in late spring and summer using slow release products. Frequent, shallow irrigation discourages root growth and can encourage weed seed germination. If you irrigate, follow proper practices. Renovate chronically thin lawns to regionally adapted species and cultivars. Bare spots and thinned areas should be reseeded. Fall is the best time to do this for cool-season grasses. Use organic-based herbicides such as corn gluten or herbicidal soaps, as appropriate. Do not seed when using corn gluten meal. Herbicidal soaps are fatty acid-based, non-selective contact herbicides. They are highly refined to penetrate green plant tissue and disrupt cellular structure, leading to dehydration and eventual death. Herbicidal soaps work by contact and will not affect underground plant parts. They can be quite effective against annual weeds, but are not as effective against perennial weeds with extensive root systems; plants will likely regenerate from their root systems. Herbicidal soaps can be effective against small annual and biennial weeds such as common chickweed, spotted spurge and crabgrass. Soaps are less effective on grasses and larger tap-rooted weeds. Because herbicidal soaps are non-selective, they can adversely affect desirable plants as well as weeds. Recent research shows that corn gluten is an effective pre-emergent herbicide that can control crabgrass, barnyardgrass, foxtails (Setaria spp. ), dandelion, lambsquarter, pigweed, purslane and smartweed. Corn gluten is a byproduct of corn syrup production. The proteins in the corn gluten act on germinating seeds to inhibit root growth. After application and a period of water stress, weed seedlings wilt and die. Corn gluten also contains 10 percent nitrogen by weight, and has a slow-release fertilizing effect when applied to home lawns. If applied at the rate of 20 pounds per 1,000 square feet, this also effectively applies 2 pounds actual nitrogen (N). Research shows that 50 to 60 percent weed control can be achieved in the first year when corn gluten is applied at 20 pounds per 1,000 square feet; 80 to 85 percent in the second year; and over 90 percent control by the third year. This is due to the reduction in weed seeds since weeds do not mature, and from the effect of nitrogen in the corn gluten increasing the lawn's density. The best time to apply corn gluten is shortly after the last spring frost and again in the fall. Water following the application if there is no rain, then allow the area to dry for two or three days. A dry period following application is required for corn gluten to effectively kill emerging weed seedlings. If excessive rain occurs following application, reapplication may be necessary. A corn gluten application can inhibit grass seed germination, so avoid using this product if reseeding or overseeding an area of the lawn. Factors to consider in the use of corn gluten include: 1) expense; 2) your knowledge of weeds and their life cycles, because it must be applied in a four- to six-week period prior to weed seed germination; and 3) possibly inconsistent results, because excessive moisture and microbial soil activity can reduce its effectiveness. New organic herbicides are available for lawn use. Chelated iron is an active ingredient (Fiesta) that provides control for broadleaf weeds in the lawn. Other products (such as A.D.I.O.S) have salt as an active ingredient and provide broadleaf weed control. Other tools available for weed management that you may wish to explore include flame weeders, hot water weeders, flameless radiant heaters and soil solarization for large weedy areas. Disease-causing organisms are always present in the lawn, ready to infect weakened plants when environmental conditions become favorable for fungal pathogens to grow. Environmental conditions that are not optimal for growing turfgrass and that stress the lawn provide the conditions for lawn diseases to develop. These would include too much or too little water, excessive heat, shade, and poor soils. Very succulent grass growing under a high maintenance fertilizer program will often provide conditions favorable for plant pathogen growth and infection. Most common lawn diseases in Ohio seldom kill the turfgrass, but cause aesthetic changes that most homeowners dislike. Fortunately, most lawns recover with changes in environmental conditions and proper maintenance. There are currently no natural organic fungicides that are useful in lawn disease management. The first line of defense against lawn diseases is the preparation of proper soil conditions before grass seed is planted. This will help to ensure a healthy lawn and is the first and often key step in a successful integrated pest management approach. The second line of defense is the proper choice of grass species, cultivars, and quality seed. Grass species with genetic resistance against many diseases are available. The third line of defense is proper turfgrass maintenance practices that can reduce disease problems, such as mowing, irrigation, fertilizing and core aeration. Reduction of disease problems in established lawns can often be accomplished by changes in maintenance practices such as mowing, irrigation, fertilization, pruning of surrounding trees and shrubs to improve air circulation, and core aeration. If properly done, these practices favor a healthy lawn and minimize disease problems. 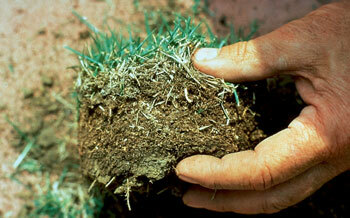 For severe lawn disease problems due to poor soil conditions or excessive thatch, renovation may be the best solution. Disease problems related to poor grass selection can usually be corrected by renovation with new disease resistant varieties. Healthy lawns contain a variety of insects and their relatives, yet most people don't know one insect from another and consider them all bad. Very few insects actually injure home lawns. Many organisms in a lawn may prey or parasitize potential pests, while others help in decaying organic matter in the lawn. For example, ground and rove beetles readily attack lawn caterpillars as well as the eggs of sod webworms and white grubs. A number of tiny flies and wasps also parasitize lawn pests. Several insect pathogens may be found in the soil and lawn canopy. A fungal disease often infects chinch bugs, sod webworms, and billbugs, especially in wet seasons and can obliterate a population. The most important practices to reduce insect pests in lawns are proper turfgrass species and cultivar selection, thatch management, proper mowing and irrigation. Many cultivars of perennial ryegrass, turf-type tall fescue and fine fescue contain symbiotic fungi called endophytes. These endophyte-enhanced cultivars are toxic to sod webworms, chinch bugs and billbugs that feed on them. If a new lawn is to be established or renovation is due, consider selecting an endophyte-enhanced turfgrass. Make sure the turfgrass species is suited for the specific environment for best growth and performance. Reduce thatch development or remove existing thatch to eliminate shelter and food for some insects. Higher mowing heights often shade sun-loving chinch bugs or billbugs, as well as raise humidity so that insect diseases may become prevalent. There are typically four insects that can cause problems in home lawns. Short sections follow on each insect pest, but more in-depth information regarding identification and life cycles can be found in Ohio State University Extension fact sheets, which are referenced at the end of this sheet. Grubs in the lawn can be the larvae of Japanese beetles, masked chafers, and June beetles. Grubs are usually found laying at the soil/turfgrass interface in a “C-shaped” position, and are off-white in color with a dark head. They feed on grass roots, causing plants to die in irregular brown patches. In lawns that are heavily damaged, the sod can be easily lifted. A few grubs per square foot are not a problem to an otherwise healthy lawn, while ten or more per square foot can cause turf loss. Lawns that are highly managed and regularly watered may actually attract beetles; allow the lawn to go dormant during July, if the weather is hot and dry. Frequent irrigation in June and July may attract egg-laying females, especially if surrounding areas are dry. In contrast, adequate soil moisture in August and September, when grubs are actively feeding, can help mask root injury. If grub damage starts to appear in late August or September, watering may promote recovery. For first time or infrequent grub problems, water daily. Even if the roots have been severed, the grass will grow hydroponically and have the opportunity to grow new roots and recover. Several parasitic wasps, Tiphia spp. 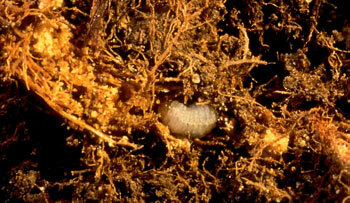 and scoliids, attack white grubs and may effectively reduce populations in certain areas. Masked chafers and green June beetles are the species most commonly attacked by wasps in Ohio. However, these parasitic wasps may take several years to build effective populations, during which time lawn damage may occur. Several insect parasitic nematodes have been successfully reared in commercial quantities, and are beginning to be available for lawn insect control. Other strains and species, especially Heterorhabditis bacteriophora, show promise for control of white grubs. Additional studies are needed to develop consistently effective nematodes and to reduce costs. Bacterial milky disease of Japanese beetle grubs, Paenibacillus popilliae (Dutky), is a biological agent for control. However, in Ohio, this disease rarely causes more than 25 to 30 percent infection and is not considered useful. Recently, strains of Bt have been discovered that are more effective against white grubs and these may be on the market within a few years. The most common billbug in Ohio is the bluegrass billbug, Sphenophorus parvulus Gyllenhal, though the lesser billbug, S. minimus Hart, is somewhat common. 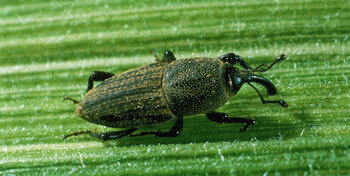 The adult weevils are 1/4- to 3/8-inch long, dark gray to black in color, with a tan or brown dusting of soil. The larvae are white with a brown head and look like small, legless white grubs. Kentucky bluegrass is the preferred host, but perennial ryegrass, red fescue and tall fescue are occasionally attacked. Billbug damage usually appears late June through August, when summer drought stress is common. Light infestations in lawns produce small dead spots that look like dollar spot, a common lawn disease. To confirm billbug injury, grasp some affected grass blades and pull upward. If the stalks break easily at ground level and the stems are hollowed out or are full of packed sawdust-like material, billbugs are the culprit. Bluegrass billbugs seem to cluster in neighborhoods, especially in intensely managed bluegrass. Neighborhoods with mixed-grass lawns or those established with resistant cultivars are less severely attacked. There are a number of bluegrass cultivars that are resistant or tolerant. Perennial ryegrass, tall fescue and fine fescue, especially those with endophytes, are resistant to billbugs. The entomophagous nematodes, Steinernema carpocapsae, S. glaseri and several Heterorhabditis, have been used to infect billbug larvae in the laboratory and in small field trials. These nematodes show promise for the future but additional studies are needed to find the optimal environmental conditions for consistent results. Chinch bugs are an infrequent problem in Ohio lawns. The adults are very small, but very characteristic in appearance; the wings are white with a black spot, making them appear to be “wearing a tuxedo.” Chinch bug damage is usually first detected when irregular patches of lawn begin to turn yellow or straw-colored; these patches become larger in spite of watering. Chinch bugs are relatively easy to manage if detected early. Since this pest requires hot dry conditions for survival and reproduction, irrigation during spring and early summer may increase the incidence of a pathogen, especially the lethal fungus Beauveria spp. The adults can withstand water because of protective hairs on the body, but the nymphs readily get wet and can be injured by large water droplets. Slightly damaged lawns will recover rather quickly if lightly fertilized and watered regularly. In general, perennial ryegrass, fine fescue and tall fescues with endophytes are highly resistant to this pest. Sod webworms are rarely a problem in Ohio lawns. Sod webworms prefer sunny areas and the larvae are often found on south-facing slopes and banks, where it is hot and dry. Heavily shaded lawns are seldom attacked. Sod webworms appear to feed on all the common grass species, however, common Kentucky bluegrass, perennial ryegrass and fine fescues show the most injury. Improved perennial ryegrasses with endophytes are highly resistant to sod webworms. Likewise, tall fescue, though often attacked, usually outgrows any injury. Injury may first appear in early spring, although the most severe injury usually appears in July and August when temperatures are high and the grass is not growing vigorously. In fact, most sod webworm damage is mistaken for heat and drought stress. Thinned areas allow weeds to invade the lawn, making it unsightly. 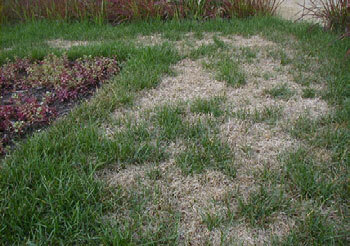 Lawns damaged by sod webworm may recover slowly without irrigation and light fertilizations. Parasites and predatory ground and rove beetles can decimate a sod webworm population. The bacterium Bacillus thuringiensis Berliner (Bt) and its toxins have commonly been used to control various caterpillars. In the past, Bt products were registered for sod webworm control, but there was little effect on larger sod webworms. Newer strains have been more effective against this pest. This calendar is targeted to central Ohio and may vary by 10 to 14 days for southern and northern Ohio. Timing in southern Ohio may be 10 to 14 days earlier; northern Ohio may be that much later. This calendar lists the general time frame for lawn practices to occur; see the text for details on various topics. Rake up leaves still on the lawn or mow to chop them. Begin regular mowing when grass resumes growth. Corn gluten may be applied for pre-emergent weed control in early April, about the time the forsythias are in bloom. Hand-pull weeds or spot treat with herbicidal soaps, as needed. Core cultivate if thatch is excessive or if the soil is compacted. Monitor for grubs, chinch bug, and sod webworm. Renovate or overseed in early September, if needed. Corn gluten application (only if no seeding work is being done in the lawn). Topdress with compost in conjunction with core aeration. Chop up fallen leaves with mowing. Continue to mow as long as the grass is growing.